I am generally a quick reader. Fast even. Mark mocks me as I read books... he reads slow and methodical, and memorizes every detail. I read fast and furious, and forget the characters' names as I read them. I just can't help it. 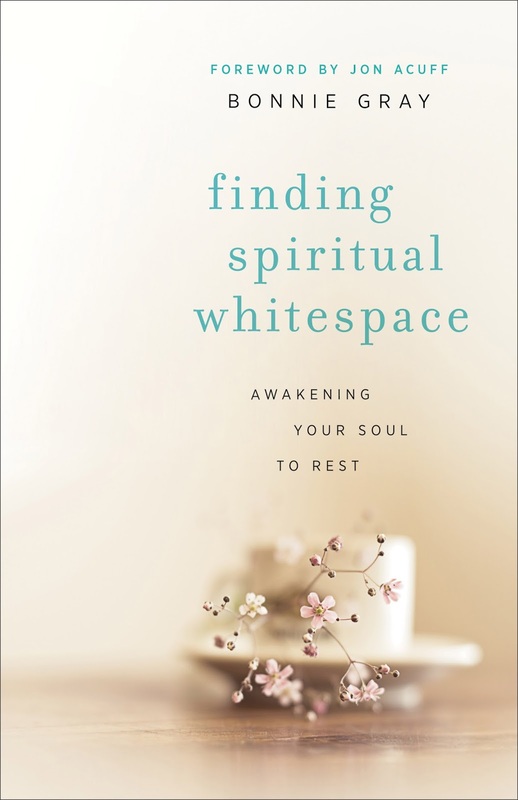 So it came as quite a shock to pick up "Faith Barista" Bonnie Gray's book, Finding Spiritual Whitespace, and not devour it in one day. I think it shocked HIM as much as it surprised me! I'd been WAITING for this book to arrive, to pre-read it and write my review, to tell others about it... and then I had to FORCE myself to get through it! I was even frustrated with me! Don't get me wrong... Bonnie has done an amazing job of telling her journey. I commented to another friend that I actually wished this was TWO books instead of one... as I delved in to it, I knew what was going on; I loved hearing Bonnie's voice tell her story, but her writing prompts at the end of each chapter PLAGUED me. I didn't want to look at MY STORY here... I just wanted to read about her own and move on my merry way. I'm still dealing with *emotional junk* and details relating to my father's death. Just when I think I'm done with it, and I've put it behind me, and I THINK I don't have to "go there" anymore, someone calls with a new bit of information, a new request for me to "check out this, or make that call" and I'm stuck in the stuff up to my knees again. I had just made a turn, grabbed the book (about 1/3 read) and left for California for a family trip, and seeing my sisters put me back in the midst of it again. I had to force myself to face the questions, and emotions, again... it was like swimming in quick sand. I prayed, recognizing that it was a spiritual problem that was keeping me from finishing the book... keeping me from completing this task. There was an element of fear that was barring me from reading the rest of the story that I wanted so badly to finish. It wasn't until a week after the trip that I sat on my back patio, on Father's Day, with the frogs croaking in the garden, and the sun sinking low on the horizon, that I finally finished reading it. I felt as if I was IN my Spiritual Whitespace when I folded the book closed and took a deep breath. I had been monitoring the sky, and was witnessing God's handiwork as He created the most magnificent sunset; pinks and lavenders washed across the sky. It was as if He smiled at me pushing through the mental barriers, my own PTSD set aside to reach through Bonnie's story and cheer her on. My tears flowed for her, not me. My heart raced with hers. I smiled for her victories. I know now that I'm done reading this book, but the book is not done dealing with me. 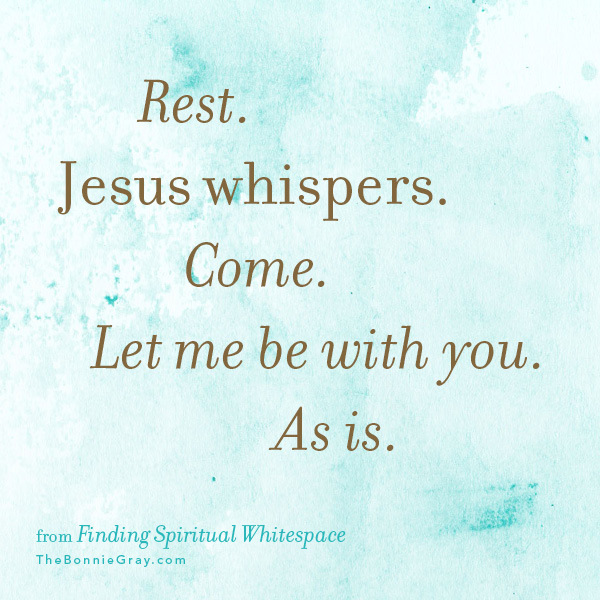 I've always been a fan of Spiritual Whitespace, though I'd never thought of calling it that before. When I speak to others about the topic of rest, I fall back on the truth that "what's rest for some is work for others." I find my rest (whitespace) in gardening, resting in nature, walking with my camera dangling from my arm. I want to paint again, to write poetry, to fall asleep in the shade of a tree. For some of you, these things might be a chore (gardening... really! It makes some folks all sweaty and dirty, but for me it brings me closer to God the Creator!). I know that it is likely that I will be journaling through the book, Finding Spiritual Whitespace, and not only will I need a friend to support me in my whitespace journey, but I may need a counselor too. I'm realizing that I need to work through my past - all of it - and reading Bonnie's courageous journey is helping me to be brave too. I'd like to get all of this behind me, to FULLY enjoy the whitespace experiences that God has for me in the future. Lord, Thank You for being there my whole life. You know the disappointments, the hurts, the fears. You are not surprised. You know my wrongs, and You know what wrongs have been done to me. Father, help me to be brave, to have the courage to be healed from the past. I pray that as other women read this amazing story, that You will speak to their hearts, and give them the strength to cling to You through Bonnie's story. I ask that for those of us that need counseling, that You will provide the right one. For those of us that need a friend, help us to find them through Your mighty hand. For each of us, help us to remember that Your love is perfect, and constant, and always here with us. You are for us. Always our loving, heavenly Father. Amen.